Greg Mueller: Where Is He Now? It’s not always easy retiring from pro sports. For every 33-year old millionaire with a mansion, a yacht, a TV contract and his whole life ahead of him, there are 10 washed-up, broke alcoholics with chronic knee pain and no way of easing back into the working life that normal folks experience every day. Greg Mueller’s story is one of the positive ones. One of the problems that sports stars face on retirement is that the insane highs of winning, and the adoration of the fans, tend to kind of ruin you for everyday life. It’s a less extreme version of what ex-military personnel often go through on returning home from a war zone. Nothing quite matches that adrenaline rush. Greg has managed to find something that offers both excitement and glamor; the thrill of professional poker. He’s not just sitting at home grinding out small wins on sites like gamblingland.com, either; you’re more likely to find him at the World Series Of Poker tables in Las Vegas. 42-year old Greg was born in Switzerland and now lives near Vancouver. In a hockey career that spanned most of the 1990’s he played defense for German teams including Ratingen Lions, Munich Mad Dogs, Trier, Duisberg and Braunlage. Until recently, when he wasn’t propping up a card table somewhere in the world he was taking care of business at his restaurant, the Player’s Chop House in Vancouver. That’s now closed down, but the Whistler branch is thriving, and its theme – somewhere between a meat market and a sports bar – seems to be proving popular with hockey fans and steak munchers alike. In some ways Greg – single – is living the life that many married men with kids dream about. He regularly makes money playing a game he loves, and he gets to travel the world doing so. 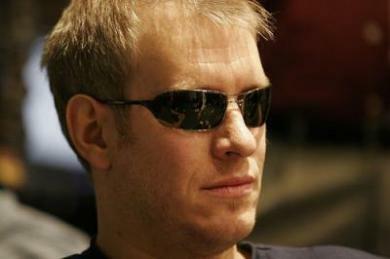 It was during the interminable bus journeys between hockey stadiums that his interest in poker developed. After retiring from the rink, he had a go at an acting career, but soon settled on cards. 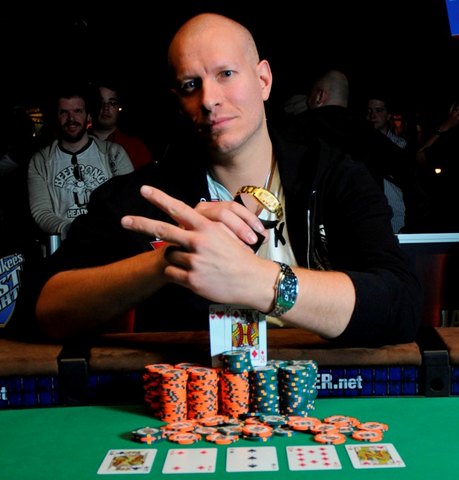 And it turned out pretty well; he’s pulled in millions of dollars playing, he’s been sponsored by some of the biggest internet poker firms in the world, and he’s the holder of two WSOP bracelets, having finished in the money more than 25 times. He hasn’t forgotten about hockey, though. He regularly posts updates from various hockey games – as well as news of wins (and losses) at the poker tables!